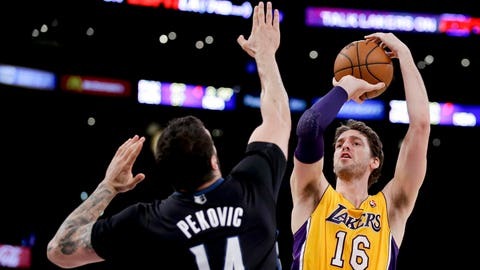 Los Angeles Lakers center Pau Gasol (right) shoots over Minnesota Timberwolves center Nikola Pekovic. Add this to the list of ones that got away. No Kobe Bryant. A depleted backcourt. Not-so-distant memories of a dominant Timberwolves win in the same Staples Center earlier this season. It wouldn’t be replicated Friday night. Minnesota let another seemingly manageable game slip through its fingers, falling 104-91 due to a lackluster fourth quarter and an atypical slow start. An injury-riddled Los Angeles group missing Bryant and fellow guards Steve Nash, Steve Blake and Jordan Farmer outscored the Timberwolves a combined 58-41 in the opening and closing frames, avenging a 113-90 bruising suffered Nov. 10. Seven times this season, Minnesota (13-14) has been in prime position to snag a key road win and failed to do so. The Timberwolves are now 5-9 on the road and in danger of falling further below .500 in the same building Sunday against the Clippers. "We have to understand that we’re trying to get somewhere," a frustrated coach Rick Adelman said. "We haven’t arrived anywhere. . . . We have to take a long, hard look at ourselves and find out what we want to do." Cleveland. Denver. Washington. San Antonio. Boston. Now both Los Angeles teams. All seven opponents displayed vulnerability when Minnesota came to town, but the Timberwolves couldn’t close the deal against any of them. Especially not the Lakers (13-13), who in front of a sellout crowd of 18,997 closed them out with a 14-2 run spearheaded by Pau Gasol’s nine points. The big man flushed home a putback and hit a 3 on back-to-back possessions to make it 95-89 with 3:58 to go, then scored the game’s final points on a jump shot with 1:17 left. Kevin Love scored a game-high 25 points and had 13 rebounds for his league-leading 24th double double. None of his points, though, came in the fourth quarter. Los Angeles outshot Minnesota 53.8 to 34.7 percent and held the Timberwolves to 6-for-25 in the final period. "We just kind of gave into the situation," Adelman said. "They outworked us. I don’t know what else to say." Until the last 5 minutes when the Lakers made their decisive push, it was a back-and-forth affair that experienced 10 ties and 10 lead changes. Nick Young came off the bench to lead Los Angeles with 25 points. Gasol and fill-in point man Xavier Henry scored 21 each, and Gasol tallied 13 rebounds. So did Nikola Pekovic — 10 offensive — who added 22 points. Young’s 4-point play followed by Wesley Johnson’s flying transition dunk highlighted a 6-1 Lakers run to close out an otherwise seesaw third quarter. Brewer fouled Young just before his left-wing prayer fell through. 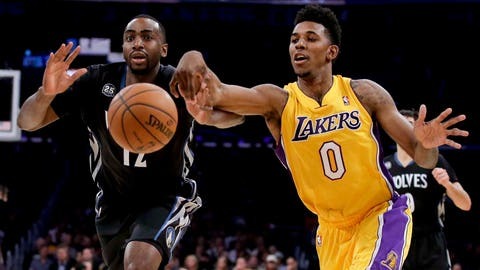 Young made the resulting free throw then rebounded Love’s miss and quickly found Johnson — whom the Timberwolves drafted fourth overall in 2010 and traded away two years later — going the other way. The Lakers led 81-76 entering the fourth and had their adversary right where they wanted it; the Timberwolves are now 1-12 when entering the fourth quarter behind. Minnesota had erased an 11-point deficit with a 20-7 run during the second quarter’s final 6 minutes. J.J. Barea got things rolling with his second 3 of the night, and Corey Brewer gave the Timberwolves their first lead with a pair of free throws at the second frame’s 2:29 mark. Love hit a pair of 3s and went 7-for-10 for 20 first-half points to counter 13 points apiece from Henry and Young. After allowing the Lakers to make 14 of 22 field-goal attempts during the first quarter, the Timberwolves tightened up and held them to 7 of 14 and forced 10 turnovers in the second. "We just started playing defense," said shooting guard Kevin Martin, who scored 14 points but missed 10 of 16 shots. "We came out flat. That’s usually not us." To Martin’s point, Minnesota entered Friday night as the NBA’s highest-scoring team in the first quarter and first half of games. But this time, the Timberwolves started and finished at a snail’s pace. "We can’t have lapses like that," Martin said. "It just carried throughout the game." Rubio plays: Timberwolves point guard Ricky Rubio missed the team’s shootaround with a minor illness but suited up and started Friday night. He went 3-for-8 from the floor and had six points and seven assists in 31 minutes, 3 seconds of action. "He was worn out," Adelman said. "I thought he got real tired in the second half."